Rare wood statue of woman pharaoh found: In a dig in Egypt, a University of Toronto archaeologist discovered a wooden statue with an hourglass figure and gentle chin that was likely crafted in Hatshepsut’s image. Consider her the Queen Elizabeth of ancient Egypt, one of the great pharaohs of her age. 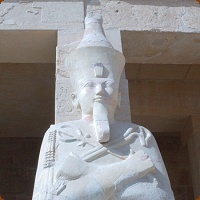 Unlike the female pharaohs before and after her, Hatshepsut, who ruled in the 15th century B.C., was a powerful leader, a prolific builder and a dedicated patron of the arts who maintained her empire’s sphere of influence for two decades at the height of that civilization. For reasons that can only be guessed at, her stepson, Thutmose III, tried to obscure her place in Egypt’s history after she died. He wasn’t entirely successful. Last summer, in a dig in Egypt, a University of Toronto archaeologist discovered a wooden statue with an hourglass figure and gentle chin that was likely crafted in Hatshepsut’s image.